Daughter Crista Kelly Chapman 27, Special Ed. teacher lives and works outside of Phill., Penn. Went to reunion in 2009 and simply had a ball. It was fun to see everyone that attended, even one person that was upset with me, that seemed to hold a grudge after 40 years. Amazing to see my fellow grads from all walks of life, from top ranking military personel to semi retired grandparents. I am still in touch with several classmates, most were not able to attend because of previous comm. and they were all asking questions as to how everyone was doing. I live and work in southern New Mexico, have been down here since I left Colo.Springs in 1972. Tried college for two years, attending SCSC in Pueblo, but it just wasn't for me, I was tired of being in school. I worked contruction for several years, learning the trade as I went, ended up working on multi-million dollar houses in the state of Hawaii for one of my brothers, Jeff, who still lives there, along with my youngest brother Chris who also lives there. I turned to ranch work in the late 70's as I enjoy be outside ,and working with animals. I had a Big Game Outfitters service for 12 years in southern New Mexico, and also taught disabled skiing for 9 years, working as a supervisor and instructor at Ski Apache, outside the village of Ruidoso, NM. 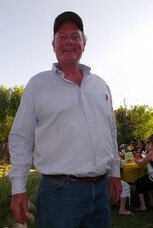 My oldest brother Jac, lives outside of Phoenix , AZ, my younger sister Stacey, lives near Ft. Worth TX. Brothe Jeff in Waikoloa, Hawaii and Chris in Kehei, Maui. Guess the best time was trying to put 69 used tires over the flag pole in front of the office one night, for a senoir prank. The AP's made two attempts to stop us, some one had called it in. Bud Jarrells Dad got us the ladder to lean up against the flag pole, which we had to push out each time to get the tire to drop(quite a feat in itself). We managed to get 15-20 tires up before we all scattered into the darkness as the AP's drove up in full force and I remember the janitor the next day out in front having to cut the tires off with bolt cutters. Kids!! Scot Chapman has a birthday today. Scot Chapman has a birthday today. New comment added. Scot Chapman posted a message. New comment added. You too have the SS birthday coming up like the rest of us. Didn't know you are an April birthday. Hope you are well Jackie,. Scot Chapman posted a message. Scot Chapman added a comment on Profile. Scot Chapman updated profile. View. Scot Chapman changed "Now" picture. Well Another year down the tubes, they are starting to roll by pretty quick. Happy Birthday Jean. Scot Chapman posted a message on Travis Jarrell's Profile. Hey Travis , Have a wonderful day! Cold here in New Mexico. Scot Chapman changed profile picture. Well Teddy here we go again! Been a few years since we last chatted. My e-m swchaps@pvtn.net drop me a line if you feel like it & I'll catch you up on what little I know. Hate to waste this pleasant reminder from AAHS, so please have a wonderful Birthday today Shelia. You guys thawed out up there yet?